Visibly lifts deep wrinkles and restores elasticity. 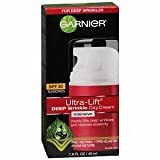 INDICATIONS:Garnier Nutritioniste Ultra Lift Anti Wrinkle Firming Moisture Cream SPF 15 Sunscreen is Dermatologist tested for safety. Non comedegenic won t clog pores.Gentle to skin. Allergy tested. Non greasy.